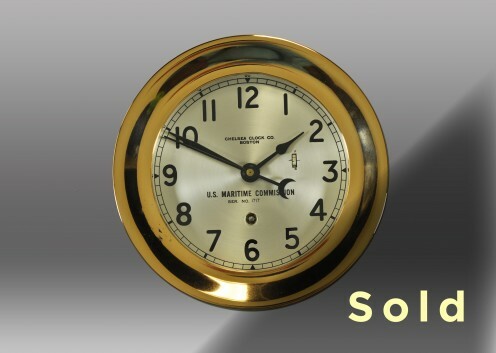 This 6” Marine Mechanical Clock was originally built circa 1942. Its solid forged brass screw case and bezel boasts a red brass finish, while the hand-silvered brass dial features 12-hour time with black numerals and includes “U.S. Maritime Commission.” The 12E movement (time-only mechanism) has been completely overhauled, including the refinishing of the dial, hands and reflector. Serial #311957.